This resource offers a number of stations which can be used to prayerfully reflect on aspects of peace. Interested in making your own labyrinth for use with your students?, Here are some instructions kindly provided by St John’s in the City Presbyterian Church, Wellington who modelled their labyrinth on one from Onslow Anglican Church, Wellington. 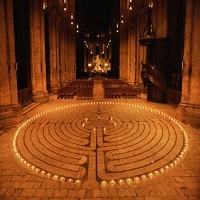 Information about the history of labyrinth and suggestions for walking a labyrinth. A simple resource for walking a labyrinth using four questions.